← Should I sell unwanted bottles on my blog? What about swaps? Muguet Fleuri is Oriza L. Legrand‘s latest offering, released just in time for 1 May, a day called La Fête du Muguet when the good folk over in France give one another muguet (or lily-of-the-valley) to wish one another happiness for the spring season. I’m a fan of the brand, having paid it a visit when I was holidaying in Paris last December, on Kafkaesque’s recommendation of Chypre Mousse. I don’t give compliments freely, but it suffices to say that I bought Chypre Mousse the very same day that I smelt it, a mere 4 hours after I first smelt it. To me, it’s a minty matcha latte, and it is unique on the market, which is rare of many fragrances nowadays. I have yet to write a full review of it, because honestly, I find it difficult to capture its beauty in words, being the metamorphic creature that it is. One day, the words will click, and I’ll pen something down. For now, though, allow me to share my thoughts on Muguet Fleuri, which somehow seems to be easier to talk about! Muguet Fleuri is straight up lily-of-the-valley. It opens bracingly fresh and very soapy indeed, and in my mind the image of a fresh-faced Audrey Hepburn in her bridal gown pops up. Muguet Fleuri possesses a dewy, semi-aquatic floral vibe from the get-go, and is very unfussy indeed, choosing to forgo embellishments for pure, unadulterated beauty. Ever since the reformulation of Christian Dior‘s Diorissimo due to restrictions placed on hydroxicitronellal, true-to-life muguet scents have been hard to come by, but I reckon Muguet Fleuri comes pretty close. Being the proud owner of vintage houndstooth Diorissimo, I decided to wear them side by side to see how they fared. I found the opening of Diorissimo to be creamier than that of Muguet Fleuri, which was green in a mildly grassy sort of way. The Muguet Fleuri also displayed more of a cucumber-melon quality in its opening movement. I thought Diorissimo packed a heftier punch than Muguet Fleuri did. Otherwise, they were pretty much similar, and I only mildly preferred vintage Diorissimo over Muguet Fleuri. About 2 hours in, Muguet Fleuri developed the astringent, polleny, and papery effect that white orchids scents are wont to develop. By this time, the aquatic notes had all but disappeared. In fact, I found this stage to be more reminiscent of the actual flowers when smelt close up, with nose pressed against the flowers instead of at a distance. If that was the effect that they were gunning for, they certainly achieved it. 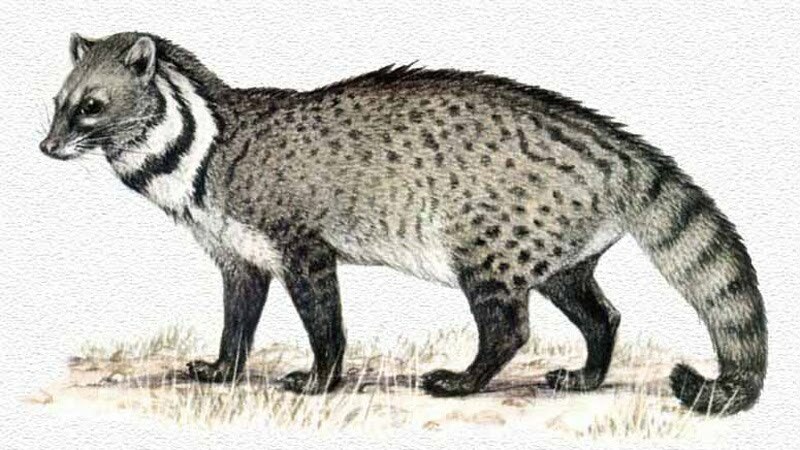 In contrast, Diorissimo decided to go down the civet path, dirtying up the pretty flowers while retaining more of the notes from the opening segment. I didn’t really prefer one over the other at this point, because I felt that both made sense in their own right, with Muguet being vintage in a powdery floral manner and Diorissimo harkening back to the past through its infusion of civet. Later on, past the 4 hour mark, Muguet Fleuri was a light, sheer, powdery veil of a skin scent whilst the Diorissimo had pretty much disappeared. Well, I can’t say I expected much longevity from either – that’s how lily of the valley scents tend to behave on my skin, which is a floral guzzler. My verdict? I’d say that while Muguet Fleuri clearly pays homage to Diorissimo, it is able to stand on its own as a solid muguet fragrance. 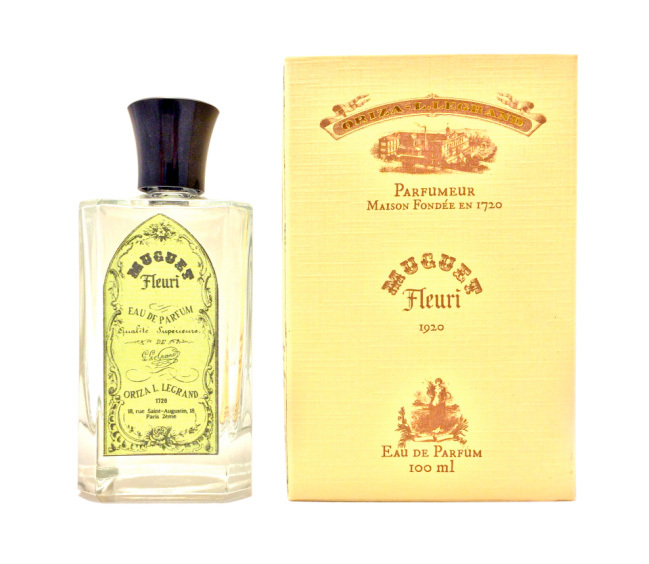 Given the reformulations that have occurred to Diorissimo, I’d say that Muguet Fleuri would make a very good alternative if you’re a fan of the other. Unfortunately, I have never had the cash to splurge on a limited edition bottle of Guerlain‘s Muguet, so I can’t say how they compare. Happy winner of an amazing draw! [Disclaimer, of sorts]: I was the happy winner of a very generous giveaway hosted by Kafkaesque and offered by the good messieurs of Oriza L. Legrand, Hugo and Franck. I was technically not a proper winner, having come in at number 16 when the draw was for 15 winners, but by some stroke of luck someone hadn’t contacted Kafkaesque with his/her details by the stipulated deadline. I then jumped at the offer when Kafkaesque very kindly emailed me to let me know that I was next on the list. Zooks hurrah! I was expecting a 10ml travel spray of Muguet Fleuri, but somehow ended up with Foin Fraîchement Coupé and Vetiver Royal Bourbon, which I have briefly worn as well, and found to be quality offerings. In fact, I think there’s something very special about the former, because it strangely reminds me very much of Johnson & Johnson baby powder with a heliotrope touch, but more on that next time. Yummy. You can find Muguet Fleuri at the Oriza L. Legrand website here, where it retails for €90, which is cheaper than most of the other fragrances, that go for €120. 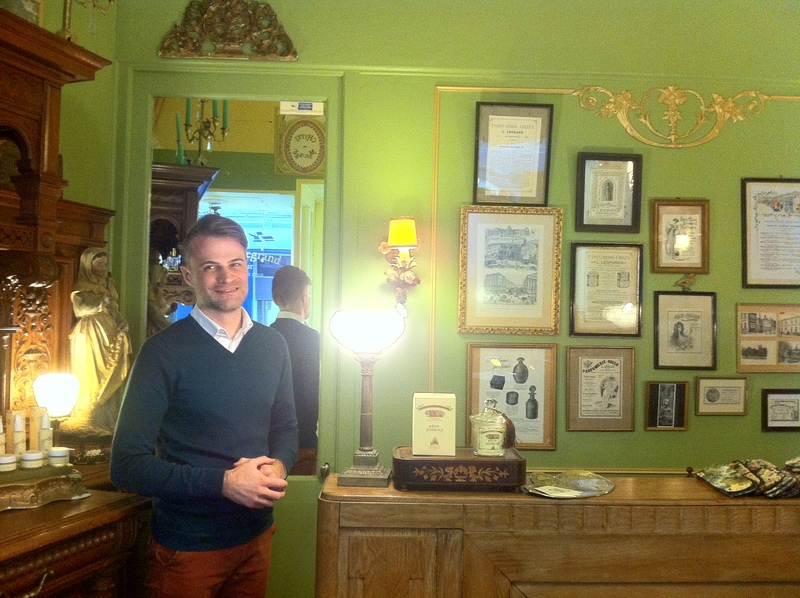 If you have the chance to pop down to their quaint little shop at 18 Rue Saint-Augustin, tell them I said hi! It’s a place that’s definitely well worth the visit. 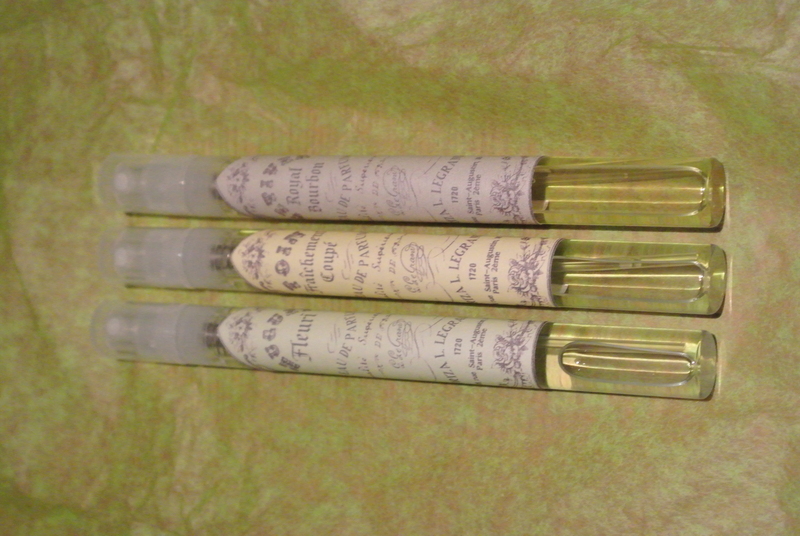 Otherwise, you could purchase their sample set of 7 x 2ml fragrances for a mere €9 from their website. Why isn’t that the most reasonably-priced sample set you’ve ever seen? Definitely beats the ridiculously exorbitant sample sets of certain companies (*cough* Ormonde Jayne *cough* – £48 for 12 x 2ml). Seriously, reasonable samples = higher sales, and many happy customers indeed. At the moment, I don’t think it’s stocked in the UK, which is a pity, because I have a feeling it will do well here. Lucky you Joshua! I signed up for a split and just can’t wait to test it! And did you say Vetiver Royal Bourbon? OMG! Is that new? Thoughts please when you can!!! I really do love the offerings from this house! I find Oriza an interesting house and love one of their scents, Relique d’Amour. They have an “old fashioned” approach to fragrance and that can be both a blessing and a curse…I didn’t have the time to visit their shop last time I was in Paris, but will certainly try next time. I wish I could compare them, too, but nope, even with the spare cash I wouldn’t pay so much just to get a pretty bottle. The scent has to move me! I was delighted to discover yesterday that Isetan in Tokyo has started stocking this line, but because I was busy researching something else I could only have quick cursory smells. The Chypre Mousse, though, did smell immediately captivating, and I can totally understand why you want to wait until the right moment. Oooh lucky you! I love how they’re stocked in Asia as well. Most niche brands don’t bother. You should plan another trip back to Isetan pronto to smell the rest 🙂 Or you could just buy a sample set from their website, I think they do worldwide shipping and honestly, I think what you get more than warrants the price you actually pay for them. Chypre Mousse is one of a kind – none like it out on the market, which is so rare in such a bloated market. I sensed it myself, instinctively. I will go back! Dear Vagabond, you make Muguet Fleuri sound lovely, especially if it can be a contender for vintage Diorissimo. I would love to visit the Oriza L. Legrand boutique in Paris one day. Hugo and Franck are impossibly charming. My Jardins d’Armide is beautiful and I get frequent compliments on it. I’m so glad you liked Muguet Fleuri, my dear Vagabond. But the thing that continues to make me the happiest is your love for Chypre Mousse. It makes me smile to no end that you bought it the same day you tried it, given my own immediate reaction to the scent. It takes a hell of a lot to distract me from a visit to Serge Lutens’ Mothership, let alone to buy a fragrance basically untested and on the basis of a mere sniff. But, as you said, Chypre Mousse is completely unique. So glad that you got samples of the other two new ones as well. Franck and Hugo are such sweethearts, and so incredibly kind. Happy May Day, my dear. Absolutely, and I am not ashamed to show my unadulterated love for it 🙂 Franck and Hugo were very generous indeed, and I will treasure what I have received. Happy May Day to you too!